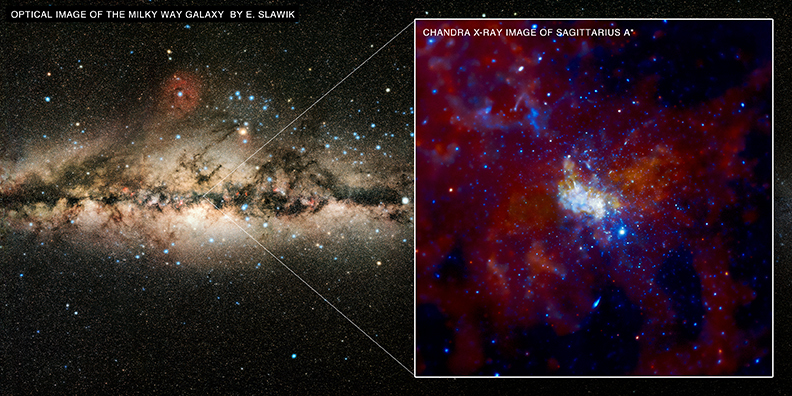 The supermassive black hole at the center of the Milky Way is known as Sagittarius A* (or Sgr A*, for short). Astronomers have known for a long time that Sgr A* is relatively quiet compared to other black holes of similar size. A new theoretical model based on a very long Chandra observation of the region may explain the feeble consumption by Sgr A*. Astronomers have long known that the supermassive black hole at the center of the Milky Way Galaxy, known as Sagittarius A* (or Sgr A* for short), is a particularly poor eater. The fuel for this black hole comes from powerful winds blown off dozens of massive young stars that are concentrated nearby. These stars are located a relatively large distance away from Sgr A*, where the gravity of the black hole is weak, and so their high-velocity winds are difficult for the black hole to capture and swallow. Scientists have previously calculated that Sgr A* should consume only about 1% of the fuel carried in the winds. However, it now appears that Sgr A* consumes even less than expected - ingesting only about one percent of that one percent. Why does it consume so little? The answer may be found in a new theoretical model developed using data from a very deep exposure made by NASA's Chandra X-ray Observatory. This model considers the flow of energy between two regions around the black hole: an inner region that is close to the so-called event horizon (the boundary beyond which even light cannot escape), and an outer region that includes the black hole's fuel source - the young stars - extending up to a million times farther out. Collisions between particles in the hot inner region transfer energy to particles in the cooler outer region via a process called conduction. This, in turn, provides additional outward pressure that makes nearly all of the gas in the outer region flow away from the black hole. The model appears to explain well the extended shape of hot gas detected around Sgr A* in X-rays as well as features seen in other wavelengths. This Chandra image of Sgr A* and the surrounding region is based on data from a series of observations lasting a total of about one million seconds, or almost two weeks. Such a deep observation has given scientists an unprecedented view of the supernova remnant near Sgr A* - known as Sgr A East - and the lobes of hot gas extending for a dozen light years on either side of the black hole. These lobes provide evidence for powerful eruptions occurring several times over the last ten thousand years. The image also contains several mysterious X-ray filaments, some of which may be huge magnetic structures interacting with streams of energetic electrons produced by rapidly spinning neutron stars. Such features are known as pulsar wind nebulas. The new model of Sgr A* was presented at the 215th meeting of the American Astronomical Society in January 2010 by Roman Shcherbakov and Robert Penna of Harvard University and Frederick K. Baganoff of the Massachusetts Institute of Technology. Credit NASA/CXC/MIT/F.K. Baganoff et al. Scale Image is 15 arcmin across. Think of the universe as a loaf of rasin bread baking in the oven. You can go from one rasin to the other and no matter which one you are on all the rasins seem to be expanding from the one you will be on. This is a simple answer about a complex subject the idea of the Big Bang. Read Steven Weinberg's book THE FIRST THREE MINUTES. This is considered the best explanation to the man on the street about the Big Bang Theory. It's a bunch of gases an matter out in space. Right? To answer your question about where's the center of an explosion, it's always in the middle. The center of the universe paradoxically is everywhere. Many scientists have agreed on the big bang theory, but, if that is true, where is the center from which it exploded? Black holes would seem to disprove the theory of expansion after explosion unless they too are expanding from some central point. The laws of physics say an explosion would travel the path of least resistance so in theory it would have radiated in every direction the same as there would not have been any path to follow. So, where is the original center? astronomers certainly do not believe that black holes *generate* matter. When will our scientists acknowledge that what they call black holes are not devourers of matter but rather GIVERS of matter? What limited thinking? All the matter there is in this galaxy except for captured matter came OUT of the black hole at its center. Black holes GENERATE matter. They are machines that create matter. They are givers. I'm an amateur, but I think I can answer these. -A is the bright white spot, as you can see if you mouse-over the image. It is bright in X-rays because gas swirling into the black hole becomes very energetic through friction and emits them. The gas obscures the black hole, and it is small. -The angle of view is from the Earth, the sky coordinates in the constellation Sagittarius are given below the article. We are looking at it through the disc of the galaxy. -The bright plume next to A is Sgr A East, a supernova remnant. Is this black hole related to the one talked about in 2012 Doomsday stories? is our earth really gona be close to this in 2012? These photos are so magical in that they just put me exactly in mind of what a tiny part of the universe we people are and how much and how little we know. And, speaking of the latter for us beginners, where exactly is the black hole? Is it the brightest point because of the gases being swirled in and the black part relatively too small to see? From what angle are we looking at it? Also what is the bright plume to the left and above the bright spot? 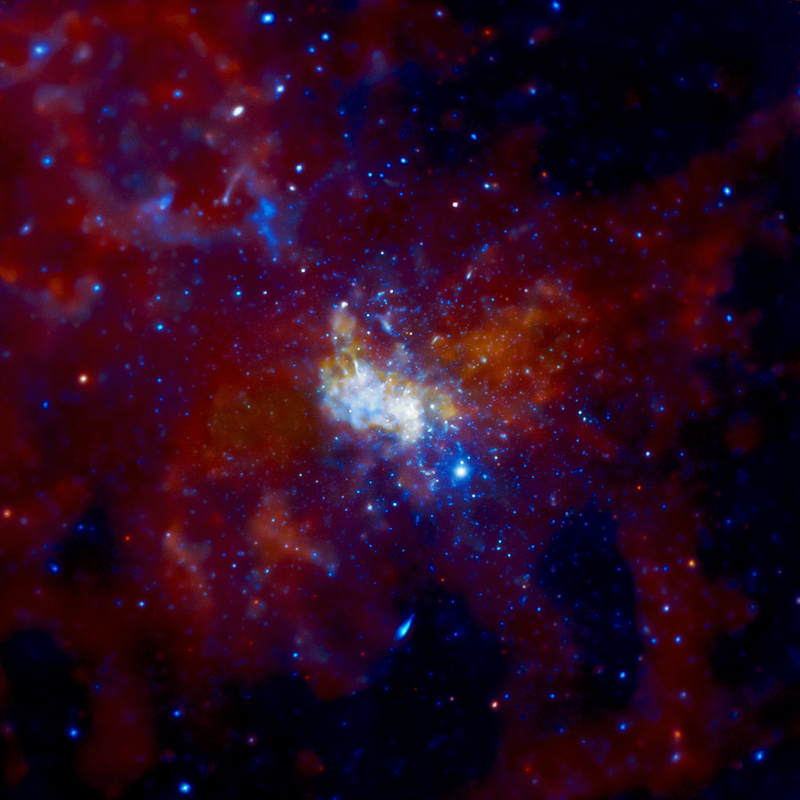 The supermassive black hole at the center of the Milky Way. By selecting different X-ray energy bands from the data and using a color code to represent them. The X-rays are shown in 3-colors: red (2-3.3 keV), green (3.3-4.7 keV), blue (4.7-8 keV). In the Zodiac constellation Sagittarius (archer), visible from both hemispheres.